The 2018 World Science Fiction Convention, Worldcon 76, announced the winners of the 1943 Retrospective Hugo Awards at a ceremony on the evening of Thursday, August 16, 2018. 703 valid ballots (688 electronic and 15 paper) were received and counted from the members of the 2018 World Science Fiction Convention. 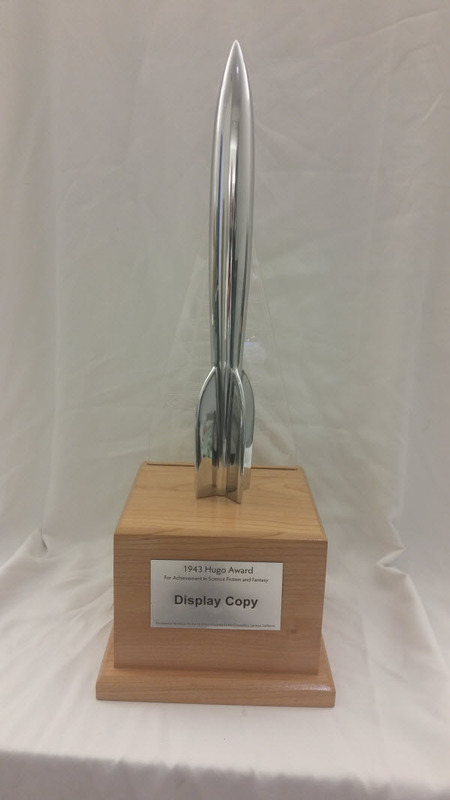 The 1943 Hugo Award winners were announced at a ceremony held at Worldcon 76 on Thursday August 16th, 2018 in San Jose, California. See also the announcement on the Worldcon 76 web site and breakdown of detailed results including subsequent placements. If you can’t be in San Jose, we hope you’ll join us on CoverItLive or watch the ceremony online. Worldcon 76 issued the 1943 Retrospective Hugo Awards Voter Packet on June 26, 2018. The “Retro-Hugo” packet is a collection of finalists (or links to finalists) for the 1943 Retrospective Hugo Awards made available to members of Worldcon 76 to assist them in making informed decisions when voting on this year’s Hugo Awards. The packet is available for download from the Worldcon 76 Hugo Awards website in the “Hugo Voter Packet” section. Members of Worldcon 76 can sign in using their Hugo Award voting credentials that were sent to them when the final Hugo Award ballot was issued. Fan history preservation group FANAC, in cooperation with SCIFI (non-profit group that ran the 1984 Worldcon) has posted video of the Hugo Awards ceremony from L.A.con II, the 1984 Worldcon, featuring Toastmaster Robert Bloch. Thanks to File 770 for the information. We have also included a link to the video in the 1984 Hugo Awards information page. The final ballot for the 2018 Hugo Awards, WSFS Award for Best Young Adult Book, and John W. Campbell Award for Best New Writer and for the 1943 Retrospective Hugo Awards opened on May 3, 2018. Members of Worldcon 76 can vote at the Worldcon 76 Hugo Awards web page. Voting is open to all supporting and attending members of Worldcon 76. Members can vote online or by using a paper ballot downloaded from the website. Voting will be open through July 31, 2018.